The air is filled with the stench of fake blood. Hollowed-out pumpkins, the flickering wax of their insides illuminating the darkened streets like lanterns, sit on every front porch. Everybody you come across is dressed like a monster. This can only mean one thing: either you’ve walked out of a BMTH concert or it’s Halloween again. To celebrate this year’s dedicated day of spookiness our dedicated team of spooky scary Edge-y skeletons have pitched in to declare our love for our favourite Halloween-themed TV scenes. Without further ado, here are our picks! A delight for any Hitchcock fan and just plain entertaining for everyone, “Too Old to Trick and Treat, Too Young to Die” is packed full of deliberate overacting, close-ups of screaming characters and very unsubtle references. It’s an indulgent spoof of Hitchcock’s greatest movies and you can tell the cast and directors had great fun shooting it, making it all the more fun to watch. My favourite moment has to be the scene in which Kelso knocks over Laurie’s shampoo as she stabs him with a loofa for hogging the shower. In true Psycho style violins begin to screech as a close up reveals red water running over Kelso’s feet and down the plug hole. Throughout the whole episode four different storylines reference, by my count, five Hitchcock films: The Birds, North by Northwest, Rear Window, Vertigo and Psycho. See if you can spot them all and any I might have missed! When talking about classic Halloween TV, who can really forget about the granddaddy of them all? I’m talking, of course, about the fantastically funny yet frightful ‘Treehouse of Horror’ special episodes of long-running cartoon sitcom The Simpsons. First airing 28 years ago in the show’s second season, the special has become one of the show’s mainstays, with a one airing every year since. The entire concept of Stranger Things is pretty synonymous with Halloween, but no episode captures the Netflix Original’s love for all things spooky quite like ‘Trick or Treat, Freak’. Not only did Season 2 have a release date that coincided with everyone’s favourite Autumnal holiday, it also had its very own Halloween episode, and boy oh boy is it a good one. From the utterly wonderful Ghostbusters costumes of Mike, Will, Dustin and Lucas, to Eleven’s desperation to don a homemade ghost outfit and join all the other kids for a spot of trick-or-treating, ‘Trick or Treat, Freak’ vividly captures the joy of Halloween as a kid (and all the horrors that occur when you’re a little bit older – be honest, we’ve all been like Nancy at *that* party at least once in our lives). 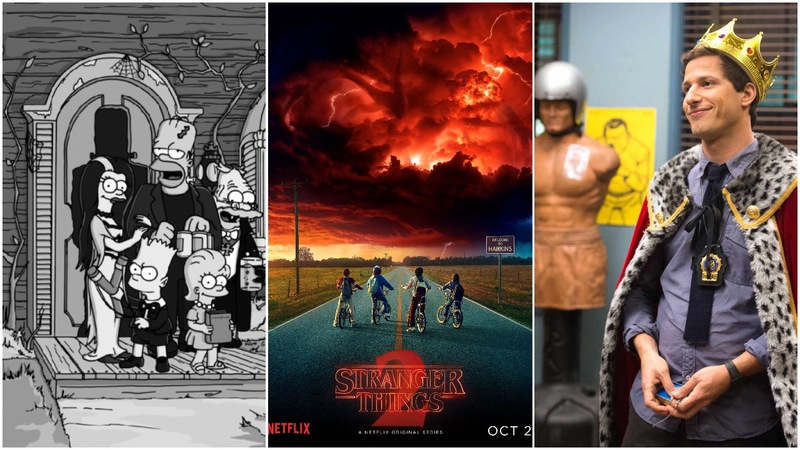 But neither Halloween, or Stranger Things for that matter, would be right without a real fright (or two), and the episode provides some real treats on that front. With Eleven’s frightening flashback, Mike’s monstrous moment and Dustin’s dustbin pal, ‘Trick or Treat, Freak’ provides many, many occasions that truly capture the essence of October 31st. The now annual tradition of Halloween Heists began five years ago, in the beloved show’s first season. With so many memorable moments throughout the following four heists, and royal babies, handmaidens, and corgis abound, it’s hard to pick just one. Perhaps it’s the triumphant moment in the first Halloween episode when Jake is the first to be pronounced an ‘amazing detective/genius’. Maybe, instead, it’s when Holt’s year-long plan comes to fruition in ‘Halloween II’, or when Gina proves her hoodie’s slogan that “Gina Knows Best”, and tricks the whole precinct with her fake front teeth in ‘Halloween IV’.